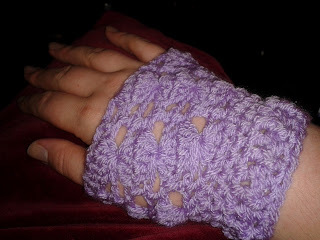 A family member requested that I make her some wrist warmers, so here they are and here's the free pattern! 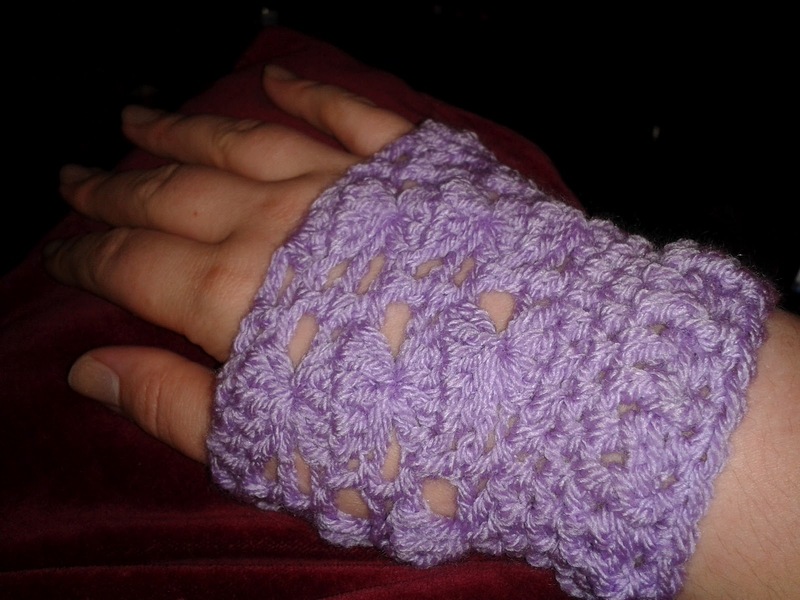 These wrist warmers work up incredibly quickly and are really pretty! So pretty that I'm going to be making some for myself now! Cluster (cl): [Yo, insert hook in next dc, yo and draw up lp, yo and draw through 2 lps on hook] 5 times, yo and draw through all 6 lps on hook. Front Post Double Crochet (fpdc): Yo and insert hook from the front to the back around the post of the dc of previous row. Complete as for a regular dc stitch. Back Post Double Crochet (bpdc): Yo and insert hook from the back to the front around the post of the dc of previous row. Complete as for a regular dc stitch. Ch a multiple of 6 sts to suit the size of the hand you’re making the wrist warmers for, and join with a sl st to form a ring. The gloves in the images above were made with a starting chain of 30. Round 1: Ch3 (counts as a dc), 4dc into same ch sp, skip 2 ch, 1 dc in next ch, *skp 2 ch, 5dc in next ch, skp 2 ch, 1 dc in next ch; rep from * to end, ending with a dc, skp 2ch, join last dc to first with a sl st. Round 2: Ch5 (counts as a dc and a ch2), skip first dc, *cl over next 5 dc, ch 2, 1 dc in next dc, ch 2; rep from *, ending with cl over last 5 dc, ch 2, join with a sl st to 3rd ch of beginning 5 ch. Round 3: Ch3, skip 2 sts, 5dc in top of cl, *skip 2 ch, 1dc in next dc, skip 2 ch, 5dc in top of next cluster; rep from *, ending with a dc, skp 2ch, join last dc to first with a sl st. Round 4: Repeat row 2. Round 5: Repeat row 3. Round 6: Repeat row 2. Round 7: Ch3, skip 2 sts, 4dc in top of cl, *skip 2 ch, 1dc in next dc, skip 2 ch, 4dc in top of next cluster; rep from *, ending with a dc, skp 2ch, join last dc to first with a sl st.
Rounds 8 & 9: Ch2, hdc into each st around, joining last to first with a sl st. Round 10: Ch3, dc into each st around, joining last to first with a sl st. Round 11: Ch3, alternate fpdc, bpdc around, joining last st to first with a sl st. Round 12: Ch1, sc into each st around, joining last to first with a sl st. Text and images by Lolly's Crafty Crochet & Laura Tegg, all rights reserved. No pattern may be reproduced or distributed — mechanically, electronically, or by any other means, including photocopying, without written permission. Finished products created with this pattern may be used for commercial sale. It is appreciated if design credit to Lolly's Crafty Crochet is listed in finished products.